Vanessa can’t get out of her head what the midwife told her about the mark on Johnny’s back usually only being found in mixed race babies. She decides to use a DNA testing kit and a swabs Adam’s bottle top to test if he is really Johnny’s father. She admits to Rhona what she has done and is later, stunned when unaware Adam suggests she moves in with him and Victoria. Rhona is pleased when Vanessa tells her she thinks moving in with them is the right thing to and she’s forgetting about the DNA results. However, when Vanessa returns home she sees that the results have arrived and she opens the letter which reveals Adam isn’t the father of baby Johnny! She checks with the lab and is even more confused when they confirm the original test result also ruled out Adam as the father. She begins to wonder how the mix up could have happened. She’s also worried how she’s going to break the news to Adam and his family who have been so excited about the baby. Plus she realizes that the real father must be Kirin. As Adam and Victoria excitedly prepare for baby Johnny and Vanessa moving in with them, Vanessa broaches the subject with Adam. After weeks of nurturing the child as his own, Adam is completely destroyed by the news and his reaction shocks Vanessa. Kirin is soon shocked to hear he is in fact Johnny’s father and Rakesh and Priya panic at just how long it will be before their involvement is exposed. Priya tells Rakesh to get it out in the open with Kirin or she’ll leave him, but will he finally confess to Kirin? Aaron is annoyed when he discovers that Chas has seen Gordon behind his back and punches the door much to both their surprise! Later, Chas tells Aaron they will forget about Gordon, but it’s clear Aaron isn’t coping well. As he goes to his bedroom, he exposes a fresh wound and heads for his penknife, clearly intent on self-harming. 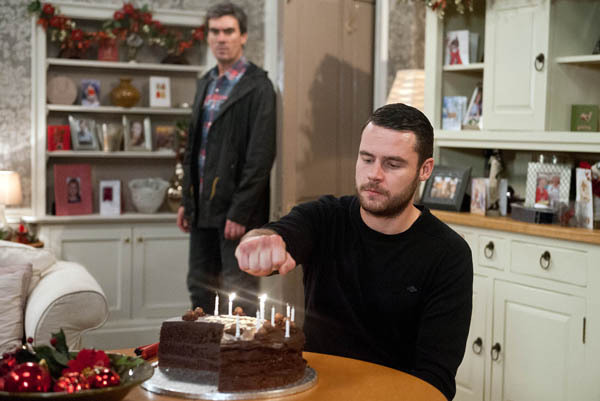 As his birthday rolls around, Aaron is clearly hating all the attention and when he thinks he’s alone he tries to burn himself only to be caught by Cain. He plays it down but can he convince Cain not to tell Chas? Meanwhile, Chas goes to see Gordon and tells him that Aaron has to come before them both and is conflicted when he tells her he wants another chance with her. As Aaron lies to Cain about having booked a session with a counsellor, Chas makes up her own lies about going to the brewery but instead heads to see Gordon and soon the pair are locking lips! Laurel still doesn’t like the idea of Ashley looking into care homes and he’s annoyed she can’t see his point of view. Unfortunately, Sandy and Harriet find the leaflet for the care home and assume it’s for Sandy. As Ashley and Laurel return home after an emotional visit to the care home, they are met with accusations from Sandy and Harriet. Sandy clearly struggles with Ashley’s news and becomes upset and unsteady on his feet, but refuses to let Ashley take him to the hospital and makes Doug do it instead. The pair bond over their worry for their children, but later, Ashley has more heartbreaking news for Sandy. Ashley decides it’s time for the kids to know about his condition before they hear it from someone else. Can they truly grasp the seriousness of the situation? Arthur blurts the news to Marlon and soon more and more people are finding out about his early on set dementia. Ashley feels the need to explain himself to Harriet and the pair share a platonic hug as Harriet makes an admission of her own. Emma wants to see Moses but Moira won’t back down so she gives Ross orders to claim back his son. Cain is angry when he learns that Moira has given Ross the child and it’s up to Pete to be a shoulder for her. Is that attraction we see in his eyes? Jai goes on a charm offensive with Leyla offering to help her with her tax return, but some quick thinking allows her to give him the brush off. Just what excuse does she come up with and could there be some wishful thinking in it? Paddy tries to call things off with Tess but can’t do it and realizes he wants to see even more of her.